Recently facebook launch a new feature for facebook called open graph search , this is advanced search engine for facebook that lets people to do advanced search on facebook as we search in Google or and other search engine and Few months ago facebook also launch a feature for facebook pages , using this feature you can add more people for admins role to your page.This features help a lot to the peoples who have many pages with maximum number of audience ,also help to increase the audience for pages.Facebook have five different administrator roles available on your Facebook page and these are Manager, Content Creator, Moderator, Advertiser and Insight Analyst. The Manager has the most and the Insight Analyst will hold the least privileges on Facebook pages.So now how to set and manage the admin roles for that follow the below steps. 1.) Go to your facebook page ,to the top of the your facebook page you will see a bar on that bar click on Edit Page& and choose Admin Roles, you will redirect to a new page. 2.) Enter the name of your friend whom you want to give privileges for your page and then choose the role and then click save.After that you have to enter your password for complete the process. See the below table privileges and permission for each admin roles. 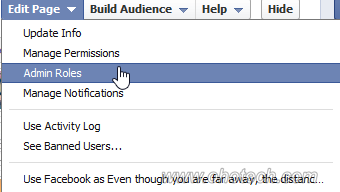 So from the above table you can choose what privileges you want to give to the user to handle your page.i hope you like my this post you can also look at my other post related to facebook like how to apply black facebook theme to your facebook.don’t forget to subscribe my blog for tech tutorials.